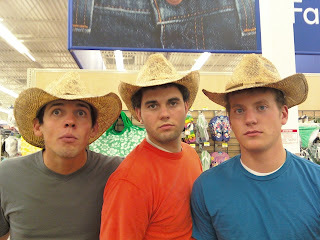 Walmart cowboys! I can't tell you how many times i have been shopping with Tyler and our friends and they haven't tried on some sort of hat! Love it! Haha great picure. So we live right in downtown. I am a manager at a storage facility right off of 600 North. It is a huge facility called Alpine Storage. Where are you guys moving to? GOSH i MiSS THESE BOYS!!! i AM SO SAD i HAVEN'T SEEN YOU GUYS FOR LiKE 1/4 OF A YEAR :( HA LOVE YOU! Thats aweseome! We'll have to plan some fun double dates!